My wife has Passat, I believe that is where the design for the Zeta came from. I didn't even know they had that! I'm calling up to order a cupholder for my storage armrest today!!! We put those same cupholders in business jets where i work, Learjet. This link doesn't seem to work. Are these arm rests still available for purchase? 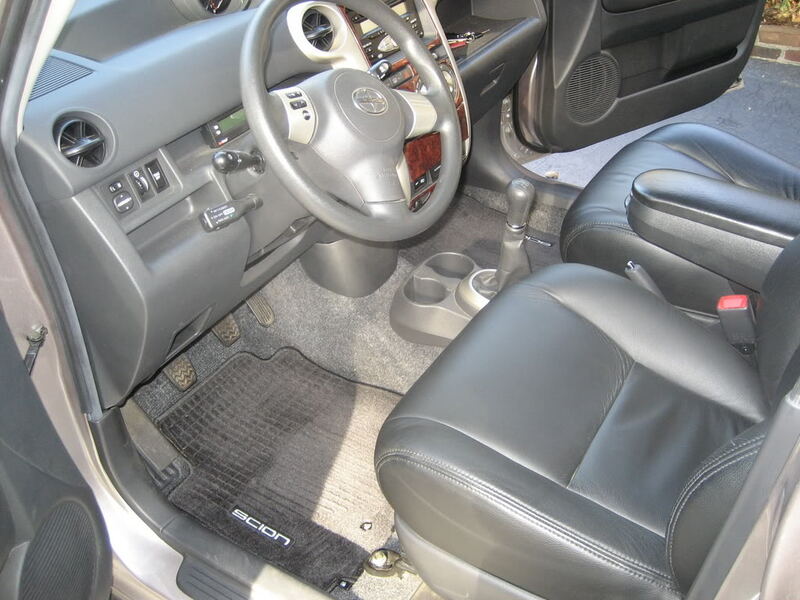 Thanks for responding, but I have a standard transmission & I'm looking for the fold-up armrest like in this thread. In this tutorial, I will be installing the Zeta Products Storage Armrest into my xA. The Zeta Products Storage Armrest is Zeta Product's newest armrest for the xA/xB. I would like to thank Angelo Marzullo at Zeta Products for providing an armrest for this install. -For the xA, the kit comes with the armrest assembly, 4x 1-1/2" long Allen head screws, 2 clamping rods, and an instruction manual. -For the xB, the kit comes with the armrest assembly, 4x 7/16" hex head bolts (w/ lock washers), 2 clamping plates, and an instruction manual. First, recline/slide the front seats all the way forward to make room for the installation of the armrest. Remove the plastic seat track mount covers of the two seat rails closest to the center console. Pulling the cover off from the front will help ease the removal. Once the covers are removed, you can mount the armrest assembly. Lower the armrest assembly over the center console. -On the xA, the rods of the assembly should sit directly next to the seat track mounts. -On the xB, the legs of the assembly should sit directly on the seat track mounts, slightly ahead of the seat track mounts. I went ahead and folded the armrest down to balance the assembly on the mounts. Now, you can start fastening the assembly to the seats. -On the xA, take two of the Allen screws and a clamping rod and fasten them into the assembly using the supplied Allen wrench. -On the xB, take two of the hex bolts and a clamping plate and fasten them into the assembly using a 7/16" wrench. Do not tighten them all the way. Once the screws/bolts are on, go ahead and fasten the other side. Once both sides have the brackets on, start to tighten the screws/bolts evenly. Once the brackets are evenly tightened, check and make sure the assembly is sturdy. If it still wobbles, you may have to re-adjust/re-tighten the clamping rods/plates. The installation of the Zeta Products Storage Armrest is complete! Now, slide the front seats back and enjoy your new armrest! Zeta Products now offers a folding cup holder for their popular storage armrest. First, slide the front seats forward so you can have room to work from the back seat. Using the 13mm wrench, unbolt "Armrest Mounting Bolt" with lock washer. Insert the bolt (w/ washer) through the cup holder assembly and fasten the bolt back into the armrest. Make sure not to overtorque the bolt. It appears the fold up armrest is no longer available from Zeta Products, they appear to be selling the Boomerang model now. Any suggestions where to find the previous model? It appears the fold up armrest is no longer available from Zeta Products, they appear to be selling the Boomerang model now. Any suggestions where to find the previous model? My big folding storage armrest is shown in Msg #30. Will sell it for what it cost new, plus shipping. Is it possible to shift a 5-speed with the armrest in use? Your arm rests on the armrest, and your fingers dangle over the shifter ****, moving it effortlessly between the gears. It is a perfect setup for shifting, and I have enjoyed it for eight years. I have the stock shifter, and have used synthetic gear oil from the beginning, and the xB gearbox is smooth as a switch. On the other hand, when I first got the car, I tried a speed shifter linkage for one day, and if that was combined with 90W oil, and if you liked the increased resistance and decreased leverage, and using a pistol grip to jam rapidly through the gears, then the armrest would interfere. The armrest is high enough to prevent getting a good pistol grip on a short shifter.